The thing about time travel is the paradox which enables movies franchises to shift and change for a hopefully better result. The first Terminator (1984) movie was a classic and became a template for other science fiction films and books over the years. Terminator 2:Judgment Day (1991) allowed the advances in FX to shine and made Schwarzenegger the biggest movie star ever. The third and fourth movie you can pretend they don't exist, at least when it comes to the fifth and newest addition to the Terminator universe. Directed by Alan Taylor (Thor:The Dark World) and written by Laeta Kalogridis and Patrick Lussier, the movie incorporates scenes from the original movie and turns things slightly askew with an alternate universe scenario. Kyle Reese (Jai Courtney) narrates the story recalling living in the ruins of the world destroyed by Skynet. He tells how he meets John Conner (Jason Clarke), the leader of the human resistance who trains the survivors in taking back their world. If you have seen the first two movies, you will understand this. He sends Kyle back to 1984 in the time displacement machine to save Sarah Conner (Emilia Clarke), John's mother, from the Terminator sent back in time to kill her. So far it's holding close to the first film, but a glitch happens, and the past where Kyle ends up is not what he expects. There's a liquid metal T1000 (Lee Byung-hun, an Asian Terminator!) in this world and it's after Kyle. He's saved by Sarah who gets to utter that famous line “Come with me if you want to live”. She is being guarded by a T800 model (Arnold Schwarzenegger) who came to save her when she was 9 years old. She calls him “Pops”. Arnold gets to battle his younger image of himself when he encounters him at the Griffith Park Observatory. Kyle has been getting images of memories that are not his, but are they? It's the alternative universe Kyle that he's seeing. They realize that history is not set. What happened when he was being set through as changed the world? They decide to go to 1997 in a time displacement machine created by “Pops” to destroy Cyberdine, the headquarters that is counting down to the upload of the App called Genisys that is on everyone's phone, TV and Internet connection. When they arrive in the future, they are of course immediately arrested. Well, they did show up naked in a big ball of light on the freeway. Enter Detective O'Brien (J.K. Simmons) who remembers the original encounter with the Terminator in 1984. Everyone thinks that he's stone cold crazy, and the cops want to turn them over to Homeland Security. O'Brien believes them and helps them escape. But them John Conner shows up and it's not all that it seems. The integration of the first movie's scenes and dialogue is a fun reminder. The twists and turns of the new movie with all the bombastic action gets to the point of sensory overload. It's one of the movies that you are either going to hate or love. 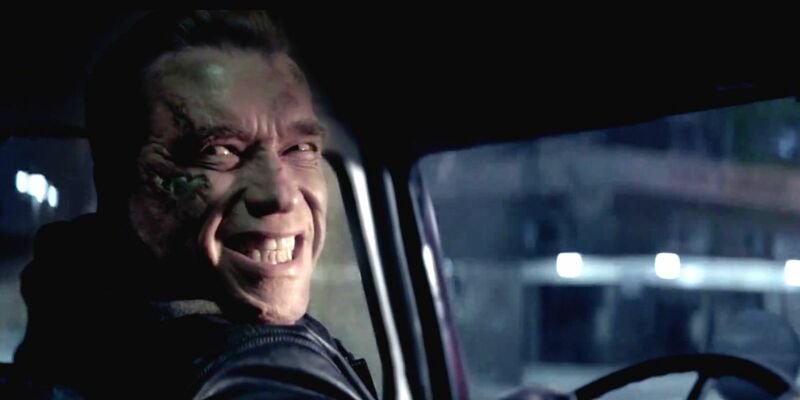 Schwarzenegger gets to mug it up a bit in Sarah's attempts to make him more human over the years. Emilia Clarke is tough, but not the hard lined version as played by Linda Hamilton and Lena Headey. Jai Courtney does well, but he's no Michael Biehn. Who will win the weekend box office with it opening against Magic Mike XXL is anyone's guess. But you can't go wrong with his one. Worth at least a large popcorn.